What do you imagine when you think of a camping tent? The first image that pops into your head is most likely a dome or triangular little uncomfortable abode. This doesn’t always have to be the case, however, thanks to cabin tents. 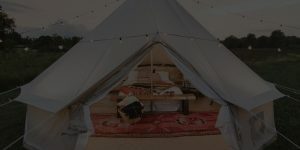 These tents usually come with a square or rectangular build- meant to give off the impression of an actual cabin- which in turn provides more vertical space than a round or pointed tip could. Along with the added vertical space, these cabin tents also provide extra much-needed horizontal space. The best cabin tents are built to be more spacious, so they are perfect for campers who enjoy going on group adventures. Moreover, these handy tents come in many different styles, meaning there is never a shortage of a new look for your next cabin tent, although you may not need one for a while, since these tents are built to last. The Coleman Instant Cabin Tent is one of our top five choices and for good reason. This tent comes equipped with all of the essentials, plus some extras that will make your camping trip a phenomenal one. Not only that, but the set up is so quick and easy that you’ll have it all up and ready in the blink of an eye. Furthermore, this tent is acclaimed for its roomy interior that fits up to two queen size mattresses, along with around six people. This feature makes it perfect for a small family or friend camping group. You’ll have no problem fitting all your campers and gear into this cabin tent. When it comes to being in the wild, you never know what may come your way. Lucky for you, this tent is built to thrive in all natural conditions. For example, it comes with Illumiline reflective lines to help increase visibility in the dark. It also comes with an impressive WeatherTec system to keep you dry in those harsh forest rains. The Coleman Instant Cabin Tent is an amazing all-round choice. From its effortless setup to its spacious interior, to its strength against nature’s challenges, this tent is sure to please any and every camper who happens to come across it. The Standing Room 100 Family Cabin Camping Tent is another one of those cabin tents that everyone will enjoy. While this tent is for smaller groups of around four people, it still proves to be a major contender in the tent market because of its many amenities. Even though this tent is not horizontally as wide as some other cabin tents, it makes up for it when it comes to length. This tent looms a massive eight-and-a-half feet from the ground to the ceiling. This is great news for those tall campers who need room to stretch out, or for those who seek extra space to stack gear. This tent also allows for increased mobility since it comes with four separate entry and exit doors. This means less chaos within the tent to get in and out through one tiny hole. Who would want to give that opportunity up? Lastly, this tent is the ideal choice for campers who love to admire the beautiful sky, whether it be during the day, or at night, when the sky is strewn with glittering stars. It comes with two zippered skylights that give you a great view of the sky above, and as a side advantage, give added ventilation. Whether you are looking for a snug tent that provides the best possible fit for four people or want a tent that gives you access to the exemplary views of the sky while you relax inside it, this tent is the one for you. Take advantage of this great home-away-from-home today! For those campers who are looking to take a trip with a larger group, the Coleman Prairie Breeze 9-Person Cabin Tent is just the right fit. Not only does this tent fit up to nine people and two queen-size mattresses, it can also be divided into two separate rooms, giving all campers a little more privacy. This durable tent is made of a hybrid material type, which allows it to stand tall and strong no matter what comes its way. This tent is completely wilderness-resistant, and not just when it comes to water. It will keep you safe and comfortable for the entirety of your camping trip. 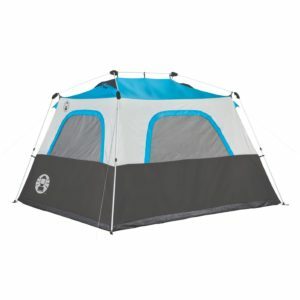 This Coleman tent is great because of the added features it displays. One of these extra features that wows every camper is the LED lighted fan system. This added characteristic helps to keep your surroundings cool, lighted, and comfortable- all things which any camper would appreciate. 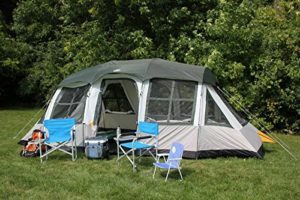 The Coleman Prairie Breeze 9-Person Cabin Tent’s massive size and various amenities make it perfect for every large camping group. It provides ample space and added privacy. Now that’s something you won’t want to miss out on. Go check out this Coleman cabin tent today! Looking for one of the tents out there for relatively large camping groups? Look no further than the Coleman 8-Person Tenaya Lake Fast-Pitch Cabin Tent. Not only is this tent spacious- it also promises a fast, simple setup, meaning only one or two people are needed to construct it. This fast setup time can be attributed to the clever fast-pitch system with pre-attached and color-coded poles and hub, fast-fit feet, and snag-free instant-clip suspension. This great cabin tent also comes with an appalling added feature that is perfect for storing that pesky gear that always seems to be in the way: a built-in closet with shelves and a hanger bar. This is significant news to those who love to stay organized and use space wisely. The Coleman 8-Person Tenaya Lake Fast-Pitch Cabin Tent is the ideal cabin tent for relatively large groups that love to camp while staying organized and efficient. The CORE 9-Person Instant Cabin Tent is a great option if you are looking for a cabin tent that will allow you to enjoy your group camping trip stress-free. One of the most outstanding characteristics that allow for this is the extremely straightforward and rocket-quick instant set up. This will save you time and energy that could be put towards taking part in other fun camping activities. This tent aims to use every square inch to its highest potential. It comes equipped with handy wall pockets that will help you keep your belongings organized throughout the entire trip. It also includes a room divider that will create two separate rooms for added privacy, for those who enjoy such things. 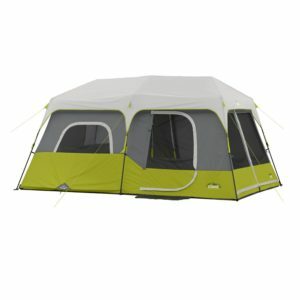 This CORE cabin tent works great in various types of weather. It comes with an impressive CORE H20 Block Technology, adjustable ground vent, and large windows that create the perfect ventilation system; all these features work together to keep campers pleased no matter what the weather may be like. Along with all of its functional features is its unbelievably quick setup- an attribute that most campers dream about. 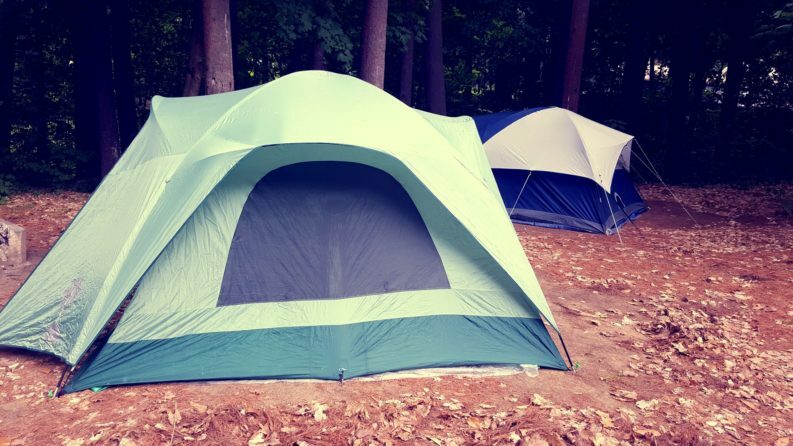 This tent is one for the books- don’t let it slip through your fingers! If you find yourself stuck trying to find a large, yet light and airy family cabin tent for your next family camping outing, the Tahoe Gear Prescott 12-Person 3-Season Family Cabin Tent is one of the best family cabin tents for your situation. 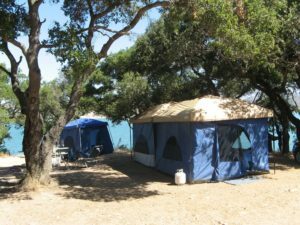 This tent is ideal for those families who love to enjoy the breathtaking views of nature from a safe and enclosed area. This tent comes with several large, open screen windows across the sides and the top of its body, giving you access to the gorgeous natural phenomena- even while you are laying inside! 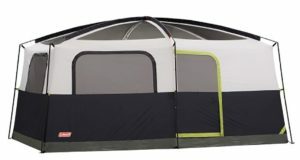 This ginormous tent also comes with easy to assemble shock-corded fiberglass poles which mean a more-than-quick setup. This also makes it easier for the younger members of the family to help with the setup, making it a nice family bonding experience for all members, no matter how old or young. The Tahoe Great Prescott 12-Person 3-Season Family Cabin Tent is a top-notch tent that will cater to all your families’ comfort and adventure needs. It is a family cabin tent that will allow for every single family member to have an active, exciting role in the camping adventure. Check this awesome tent out today! n, this tent only takes around two minutes to set up! This quick setup time allows for the most efficient use of your time- a valuable thing, especially when you are extremely crunched for time. Not only does this large cabin tent easily sleep around twelve people, it also comes with many functional characteristics. 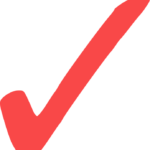 For example, you have quick and easy access to any electrical port through the electrical access port. For added privacy, there is the extra option of room dividers that split the large tent into three separate, comfortable rooms. To add to its functional advantages, this large cabin tent’s physical appearance is one that you won’t forget. 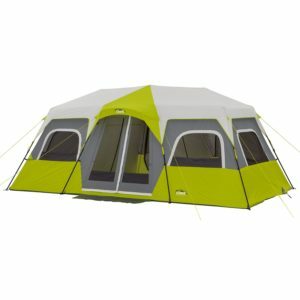 Its simple yet sleek façade and glowing green color, contrasted with the white and gray, make it a tent like no other. Wherever you may find yourself settling down, this tent is sure to be one of the most beautiful things for miles. Overall, this tent provides every single possible feature that any large camping group could think of. For anyone who wants to have an unforgettably fun camping experience, the Core 12-Person Instant Cabin Tent is the best large cabin tent for you and your camping peers! 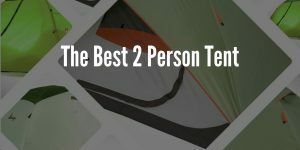 In my opinion, the CORE 9-Person Instant Cabin Tent is the best cabin tent overall. This is a tent that will facilitate fun experiences with your camping group, but without the usual stress. One of my favorite things about this tent is the straightforward and speedy instant setup, which saves my time and energy. I also love how this tent tries to use every bit of space in the most efficient manner. For example, it comes equipped with wall pockets that help me keep my belongings organized throughout the entire trip. It also includes a room divider that creates two separate rooms for added privacy, for those who enjoy such things (me being one of those people). In addition, this cabin tent works great in many different types of weather. 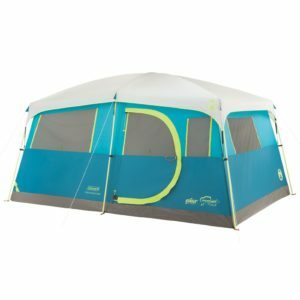 It comes with a functional CORE H20 Block Technology, adjustable ground vent, and large windows that create the perfect ventilation system; with all of these combined, I have never had trouble adapting to the changing weather in this tent. This cabin tent comes with a plethora of amenities that all add up to make it one of the best cabin tents on the market, as well as the very best cabin tent for me! I would definitely recommend it to anyone who is looking for a formidable cabin tent. Cabin tents are a one-of-a-kind type of tent. They work perfectly for camping adventures that include large camping groups who like to maintain the ambiance of a cabin, while staying in a tent in order to be a bit more in touch with nature. The build of these tents not only fits more people, but it also fits more gear because of the squared-off top- yet another advantage for bigger groups. 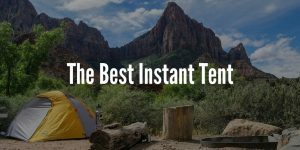 These advanced, efficient tents are surely something you won’t want to look over, if you find yourself planning a group camping trip.